An ancient Tibetan healing secret is finally being discovered in the West. For thousands of years Tibetans used a fruit that grows wild in the Himalayan Mountains as food and medicine to treat many serious health conditions ranging from breathing disorders to skin problems. Now science is proving that sea buckthorn is potent natural medicine. Like many superfoods, sea buckthorn contains numerous powerful antioxidants that help the body deal with free radical damage (now linked to almost every illness and aging). 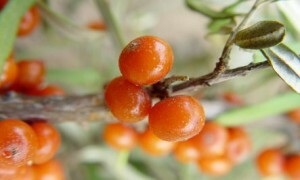 But sea buckthorn doesn’t stop there, it is also an excellent source of important Omega 7s. That’s not a typo. You may have heard of Omega 3s, 6s, and 9s, but 7s are also important. And sea buckthorn is one of the best sources of this critical essential fat. Sea buckthorn also contains over 190 nutrients and phytonutrients, making it an extreme superfood. It has plentiful amounts of flavonoids—phytonutrients found in research to prevent cancer cells from multiplying while reducing pain and inflammation, and contributing to weight loss in overweight individuals. The superfruit also contains plentiful amounts of the important healing enzyme superoxide dismutase (SOD)—actually, four times more than ginseng, another good source of SOD. Asthma, chronic coughs, other breathing disorders, and skin conditions are a few of the traditional uses for sea buckthorn, but it has also been shown to improve the health of eyes, mouth, and mucous membranes. Other research shows it dramatically reduces harmful cholesterol levels and C-reactive protein, which is known to inflame and damage cells and be linked to illnesses like heart disease. Its anti-ulcer compounds combined with its natural anti-inflammatories make sea buckthorn an excellent choice for gastrointestinal complaints. The oil appears to provide a protective and healing coating to the stomach and gastrointestinal (GI) tract, reducing the effects of harmful microbes like E-coli. When it comes to skin conditions, it has been shown effective in a wide variety of ailments, including: acne, burns, dermatitis, eczema, rosacea, stretch marks, and wounds. Many of its 190 nutrients are likely at work in these conditions but its high amounts of Omega 7s cause skin cell regeneration, minimizing wrinkling and the appearance of aging skin. Based on research published in the journal Biochemical and Biophysical Research Communications scientists concluded that sea buckthorn could be used as a therapeutic agent against inflammatory skin diseases. Sea buckthorn’s cancer-fighting abilities are impressive. In a study published in ISRN Pharmacology, researchers found that sea buckthorn was effective at killing cancer cells and lymphatic leukemia. Other research published in the journals Fitoterapia and Nutrition and Cancer showed that seabuckthorn exhibited remarkable antitumor activity and anticancer effects. As if all of the above wasn’t enough reason to love sea buckthorn, this overachieving superfruit also helps with weight loss. Few foods can match sea buckthorn’s high levels of Omega 7s which work as signals to stop the body from storing fat. It also helps people keep the weight off once its lost. Multiple studies show sea buckthorn’s effectiveness at reducing cognitive impairment and the treatment of a condition called dyskinesia. Dyskinesia is a degenerative neurological condition involving motor impairment. Research published in Medical Science Monitor found that sea buckthorn fruit extract has a protective effect against dyskinesia. It’s no surprise that any food this rich in nutrients would also boost the immune system and energy levels. Sea buckthorn oil also works as a natural sun-protectant. Hexane is used in the processing of most sea buckthorn on the market, even by many companies claiming “vegetable oils” used in the extraction of sea buckthorn’s therapeutic compounds. Choose a reputable company that is committed to the highest standards of purity. There are many different sea buckthorn products, including: berry oil and berry oil capsules, seed oil and seed oil capsules, powder concentrates and capsules containing the concentrated powder, as well as skin care products. This entry was posted in Education, Health Benefits. Bookmark the permalink. ← Sea Buckthorn on Fox News! Sea Buckthorn Oil – The Nutritional Supplement for You?